This is your all-you-need-to-know guide of Tan Dinh Market, a great place to eat, shop for fabrics, and explore local life. 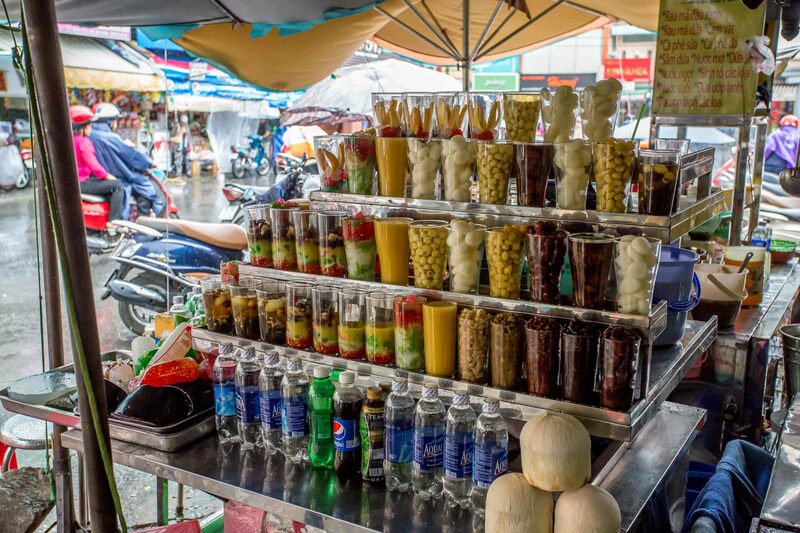 If you really want to get in touch with Vietnamese culture, and blend in with the locals, just visit some of their oldest markets. 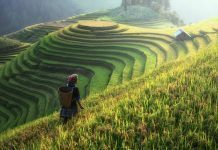 This is where you can observe Vietnamese people in every aspect of their lives, from the way they talk and the way they eat, to how a typical day in Vietnam unfolds. Among the most famous markets, Tan Dinh market is simply intriguing and something not to miss out on if you are traveling through Saigon. This is an all-you-need-to-know-guide! The clutter of this market is what makes it charming. 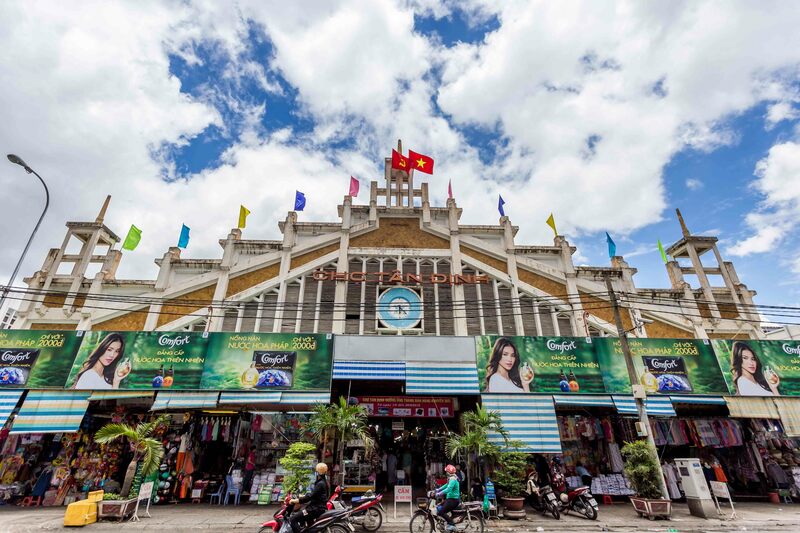 Built by the French colonial government in 1926, Tan Dinh market serves as one of the city’s historical monuments as well as a well-known shopping location for both locals and newcomers. 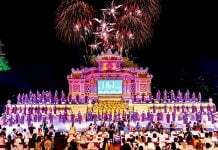 Since it is located right at the corner of the Hai Ba Trung – Nguyen Huu Cau crossroads, it has four gateways. Back in the 1870s, this market was held by the locals themselves and it was widely referred to by the name Phu Hoa market, which was one of the most important markets in the north of Saigon. Later, perhaps because it was situated near Tan Dinh church, the market was increasingly known as Tan Dinh market. The highlight of this market is its unusual and attractive facade which includes three steeples – one in the middle and two on either side. 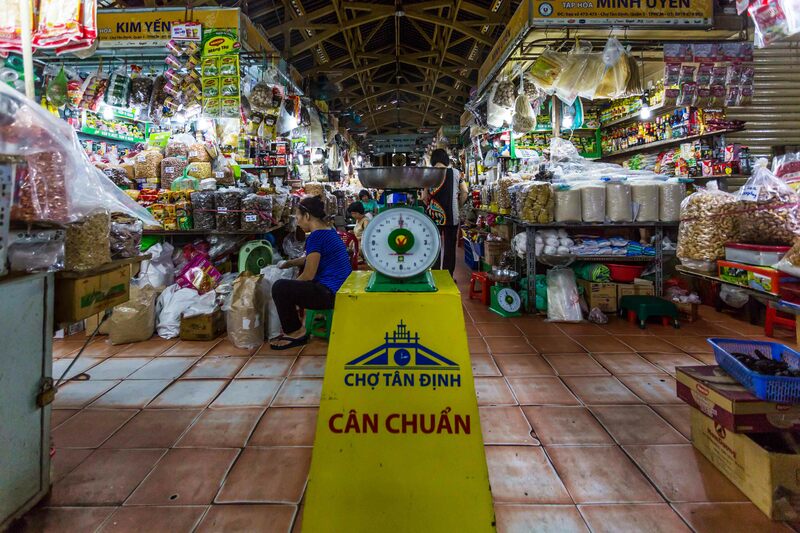 The minimal and classical architecture of Tan Dinh market makes it stand out easily from other markets in the city. 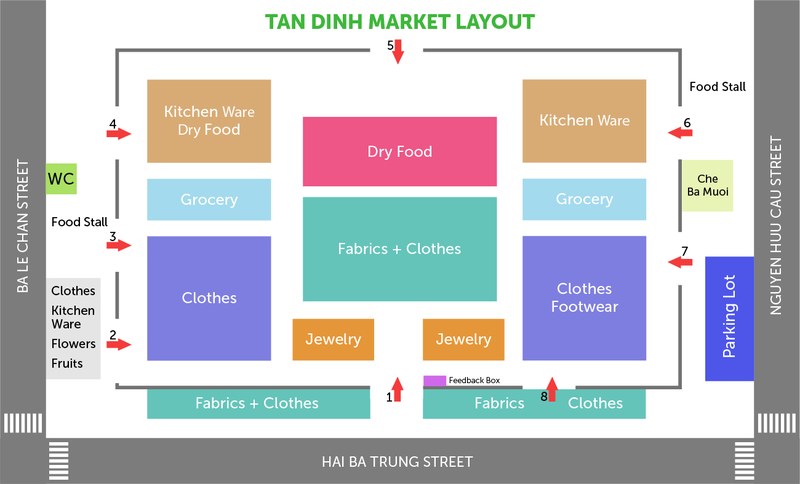 After nearly 100 years of existence, Tan Dinh market has remained as a prominent commercial center of Saigon’s downtown area which houses a food court and thousands of stalls selling groceries, clothing, footwear, fruits, textiles, and everything in between. An extra point goes to the professional security team of Tan Dinh market patrolling everywhere to maintain discipline in the market area. Additionally, with the adjacent parking lot opened for visitors, shopping at Tan Dinh market has become peaceful and comforting. How Can I Get To Tan Dinh Market? Just hop on your motorbike! 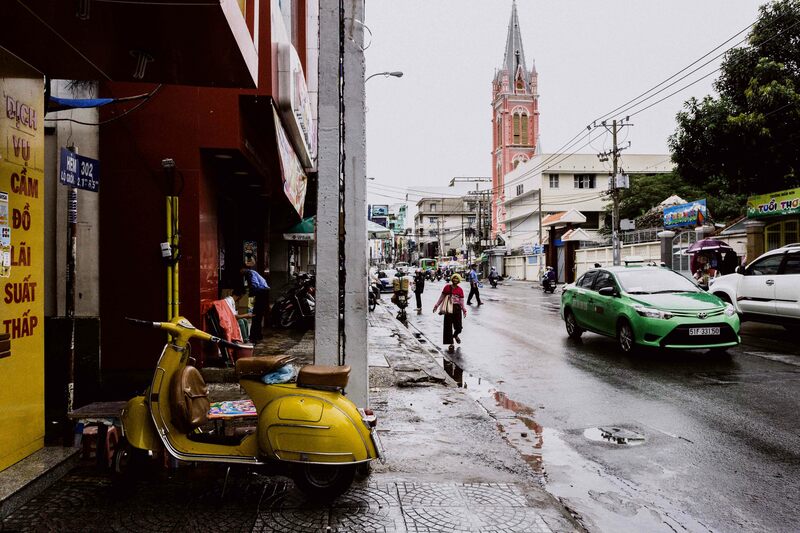 Head north from the city center and the market should be along Hai Ba Trung street, just across the road from the prominent landmark of Tan Dinh church. It only takes a ten-minute walk to get to Tan Dinh market from the Turtle Lake (Ho Con Rua). You can’t miss it! Besides, there are several bus routes to Tan Dinh Market, such as 38, 10, 28, and 54, to help people and tourists to reach this location with ease. What Can I Find At Tan Dinh Market? At the front of Tan Dinh market stands a multitude of street vendors offering some of Saigon’s best street food. If you want to taste a glimpse of the Vietnamese food heaven, put Tan Dinh market on your itinerary! We especially recommend bun rieu – one of Saigon’s signature dishes (noodle soup with crab paste with a slightly sour taste), sup cua (Vietnamese crab soup served with pig brain and century egg), and sea snails. Moreover, the huge and famous che stall (Vietnamese sweet soup) – an amazing Vietnamese dessert, named Che Ba Muoi never fails to win the hearts of food lovers. All types of che are sold at an average price of only 10,000 VND. Although the vendors’ English is not the best, they are conversant with the art of point-and-order. Choose the color and the tailor does the rest. 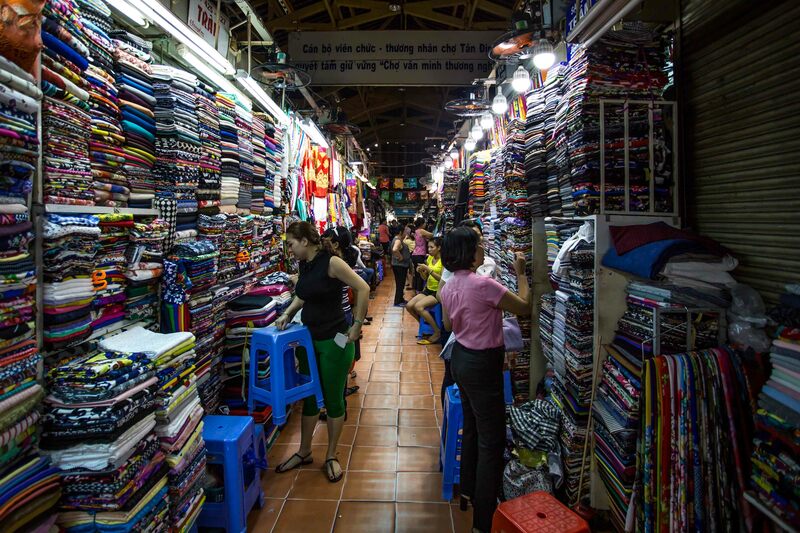 If you’re looking for local silks in sophisticated patterns and colors, Tan Dinh market is the place to go. The fabric section starts to emerge as you walk into the main area of the building. Although it’s a little bit overwhelming, an eye for a good catch, persistence, and some bargaining skills will reward you handsomely. Everything is available! Expect knits, cotton, and even lace for you to sew your own creations. And if you’re determined to find something interesting here, browse around as a lot of stalls offer unique fabric such as floral chambray, ombre gingham, and whimsical voiles. Also, you’ll see the widest collection of prints you never thought possible: florals, tropical fruits, ancient villages, etc. Although it’s a little bit overwhelming, an eye for a good catch, persistence, and some bargaining skills will reward you handsomely. 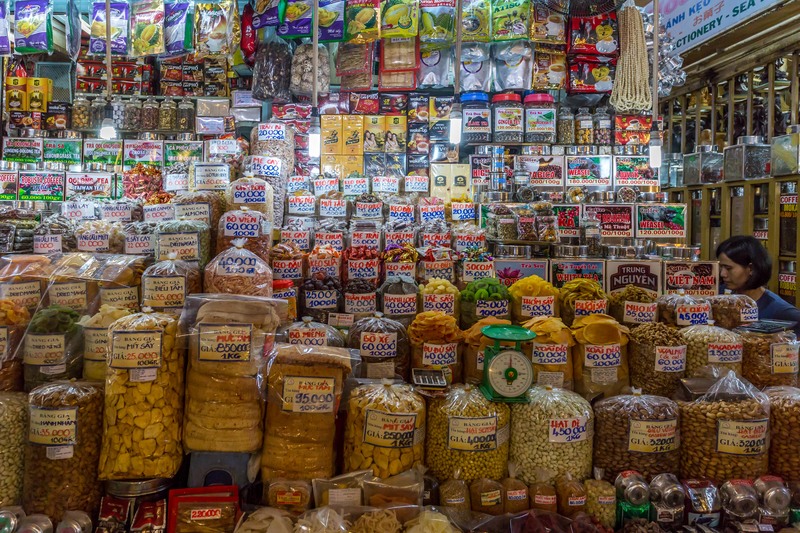 Although food and fabrics are Tan Dinh market’s specialty, this market also contains a plethora of commodities to make your everyday routine that much better or bring something home to remind you of Vietnam! Clothing, footwear, accessories, fresh produce, household items, and many other thing, you name it! Many products are of good quality but there are also other ordinary products that they sell at affordable prices for people with small budgets. If you’re not Vietnamese, the vendors will try to overcharge you. Be ready to haggle or simply say no if you feel as they have asked for too much. Ask the sellers about their return/exchange policies. If you’re planning to buy fresh food, go in the early morning. If you’re going fabric shopping, stop by at noon or later for better prices. Dress casually and comfortably as it could get scorching hot inside the market. Since Tan Dinh market is surrounded by some of the most bustling streets such as Hai Ba Trung, Tran Quoc Toan, Nguyen Huu Cau, the traffic jam could get extremely bad when it comes to peak hours, so choose your time wisely! Also check out the Tan Dinh Church nearby. 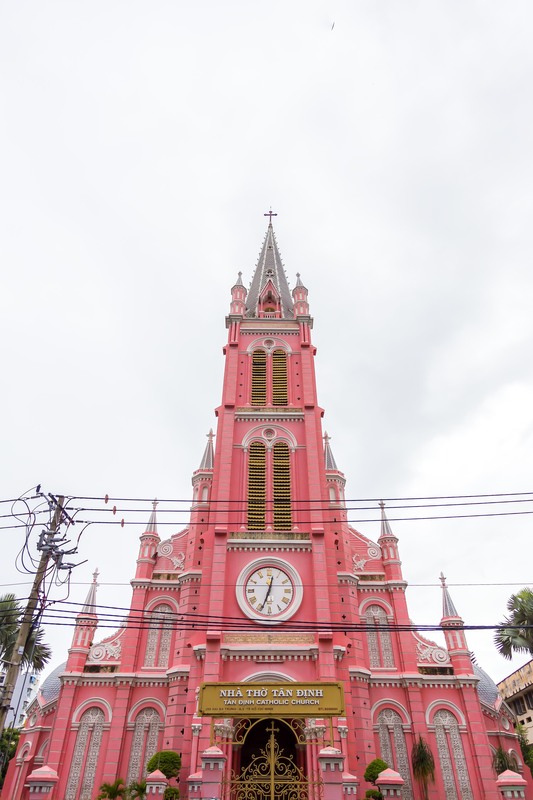 This is a unique building fully painted pink and probably will give you the most memorable snapshots while staying in Saigon. How can you resist that color? Tan Dinh market is an all-in-one place where it is possible to combine everything in one short trip: amazing food, sightseeing, and shopping. Whether you have a few hours or a whole day, Tan Dinh market is definitely worth a visit. Don’t be afraid to get off the beaten track to discover an authentic experience! The goods are abundant and have many different quality levels, depending on the prices. Security is great thanks to the professional guards. The food court offers many delicacies. The parking lot is next to the market, and is quite safe and comfortable. There are several bus routes to the market. The prices can be pretty high as opposed to other markets in the city. The narrow alleyways make moving around quite inconvenient. The food court is not very hygienic. The market access is limited during peak hours. 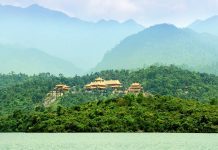 If you enjoyed this article, follow The Christina’s Blog for more fun info on what to do, see, and eat while in Vietnam! This is a good article and helpful. Could you tell me what is the closing time for Tan Dinh market? I agree with 33Brady, you have awesome content. I’ve been in Vietnam for 4 months and only found this because I was looking on Craigslist VN for marketing work and saw a job posting! really loved the standard info an individual supply for your guests?